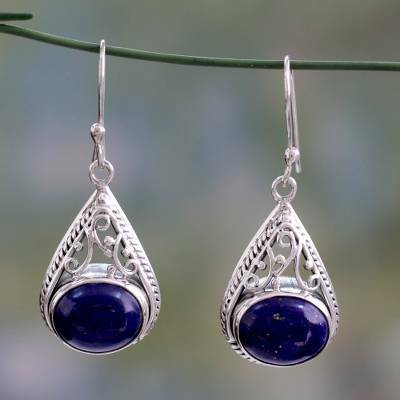 Fair Trade Lapis Lazuli and Sterling Silver Earrings, "Royal Grandeur"
In ornate sterling silver settings fit for a queen, lapis lazuli's blue depths are mesmerizing. India's Neeru Goel presents the original earring design, in which the lapis cabochons are set in rope-edged bezels and adorned with traditional jali openwork. Day And Night Earrings Day Earrings Evening Earrings Night-Out Earrings. "For ME at my daughter's wedding!" The style of these earrings matched the style I purchased as a gift for my daughter for her wedding, but the stone matched my dress. I loved that we felt connected through the 'matching' jewelry, and we both have beautiful pieces to remind us of the day. These beautiful earrings are the third order I have placed with the wonderful Neeru Goel. They are substantial yet delicate (i.e., comfortable in your earlobes) and are a joy to own as well as to wear. Thank you! Drop dead gorgeous. Fast shipping and very well packaged. I purchased the earrings, necklace, bracelet and ring and have enjoyed wearing them so much. In fact, they are my "go to set" whenever I am wearing blue.